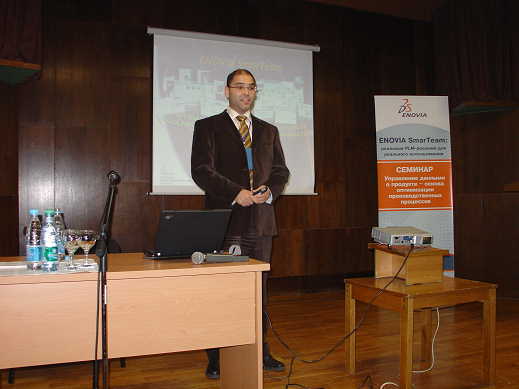 The first Russian seminar on ENOVIA SmarTeam solutions for product lifecycle management (PLM) was organized in Novosibirsk on 22-23 March 2007 owning to the joint efforts of ENOVIA SmarTeam, Dassault Systemes Russia, Hetnet Consulting, Bee Pitron and LEDAS and informational support of the CAD/CAM/CAE Observer magazine and the Isicad.Ru e-portal. Around 60 representatives of Novosibirsk companies from various industries assembled in the Sibir hotel for the two-day seminar with the slogan “Product Data Management – The Basis for Production Efficiency”. A number of journalists and members of educational institutions (Novosibirsk State Technical University, Tomsk Polytechnic University and the Bauman Moscow State Technical University) also attended the venue. 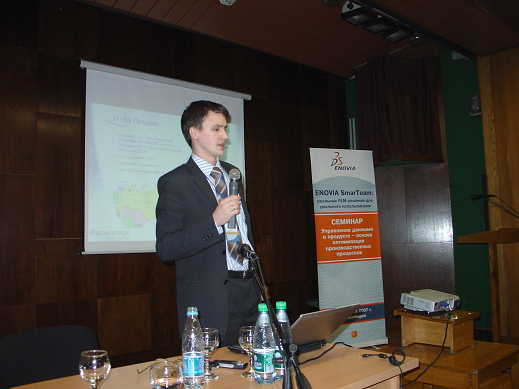 The Seminar was opened by Laurent Valroff, the Director of Dassault Systemes (DS) representative office in Russia. In the welcoming address, he said that ENOVIA SmarTeam seminar became the first public event for Dassault Systemes Russia Corp. in 2007. Hard-driving Russian market has always been of interests to DS. A world leader in 3D and Product Lifecycle Management (PLM) solutions, the Dassault Systèmes group brings value to more than 90,000 customers in 80 countries. A pioneer in the 3D software market since 1981, Dassault Systèmes develops and markets PLM application software and services that support industrial processes and provide a 3D vision of the entire lifecycle of products from conception to maintenance. The Dassault Systèmes portfolio consists of CATIA for designing the virtual product - SolidWorks for 3D mechanical design - DELMIA for virtual production - SIMULIA for virtual testing and ENOVIA for global collaborative lifecycle management, including ENOVIA VPLM, ENOVIA MatrixOne and – finally - ENOVIA SmarTeam, which was in the focus of the Novosibirsk seminar. ENOVIA SmarTeam – a multifunctional entry-level PLM-system for collaborative design engineering. Flexible and adaptable platform – possibility of progressive up-grade. 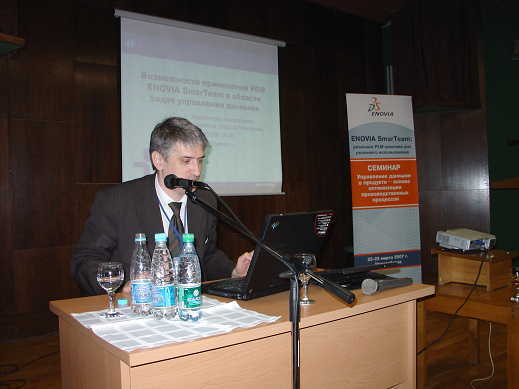 In a separate presentation, Oleg Shilovitsky described the ENOVIA SmarTeam competitive landscape identifying four main competitor groups: engineering systems (low-end means for e-documents storage supplied with every CAD); PLM-systems provided by the main competitors; PLM-modules integrated to the ERP/MRP/BPM systems; as well as local customized solutions. The speaker pointed out ENOVIA SmarTeam advantages over each of the four competitors and stated that today ENOVIA SmarTeam is the best PLM investment opportunity for the customers. An important advantage of ENOVIA SmarTeam is its profound integration with Microsoft products – SQL Server, Office, BizTalk Server, Visual Studio, etc. In the near future we should be able to see the results of the Microsoft - Dassault Systemes strategic partnership, when PLM-solutions become part of a new platform integrating Microsoft business applications. 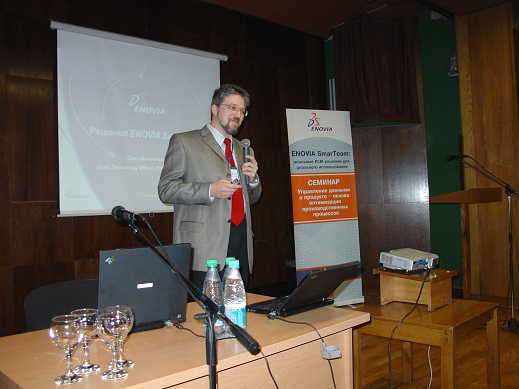 David Segal gave an overview of ENOVIA SmarTeam solutions with comprehensive characteristics of the system implementation mechanisms that are based on the component approach. Over than 10 years experience in industrial implementation (since 1995 the system has been implemented by more than 4000 companies) enabled ENOVIA SmarTeam experts to describe the business processes typical for all international as well as many national industry standards. The descriptions were used as a foundation for ENOVIA SmarTeam express-solutions – preconfigured and ready-for-collaborative-work packages that can be fully implemented by a company within 10-30 days and later gradually evolve into a full PLM-solution. Browsing various data formats without the need for specific applications. 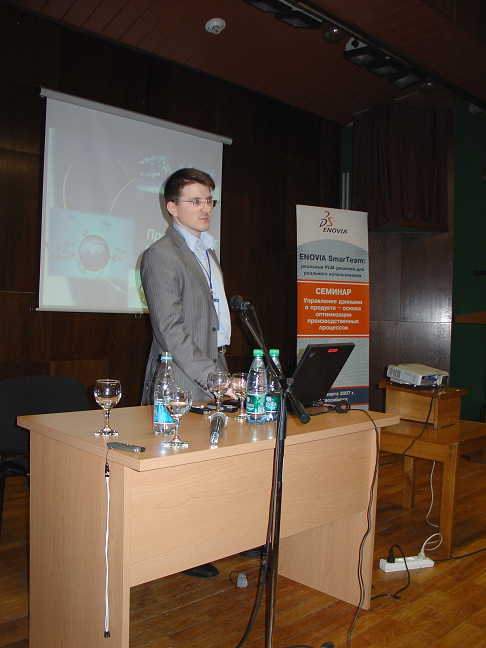 Grigory Chernobyl’, another expert from Dassault Systemes Russia Corp., made a number of presentations where he gave a profound account of the far-reaching configuration capabilities of ENOVIA SmarTeam and demonstrated some ready-made solutions for sales management and project data management. He encouraged everyone to pay special attention to the existing integration of all versions of the 17 most popular CAD systems and the possibility to read over 750 text and graphic formats. Alexei Petukhov, of Dassault Systemes Russia Corp., reported about the project on implementing ENOVIA SmarTeam at the Korolev «Energia» Space-Rocket Corporation. The project was implemented within a year and included the company’s audit, requirements development, concept plan preparation, software selection, as well as developing additional applications and a new system based on ENOVIA SmarTeam. Also it covered developing data and business process models and training. Russian business partners of Dassault Systemes – Hetnet Consulting (Moscow) and Bee Pitron (St Petersburg) – have accumulated solid experience of implementing ENOVIA SmarTeam in Russian companies. Pavel Goldovsky, PLM Marketing and Sales Director, and Nikolai Lyaskovsky, Deputy Director General, shared Hetnet Consulting experience with the audience. Seminar participants were especially interested in ENOVIA SmarTeam industry solutions implementation at the Krasnoyarsk Harvester Plant and the “Pavlovsky Avtobus [Bus]” Company. 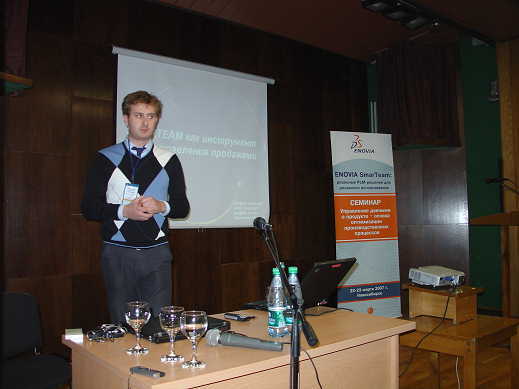 Igor Volkov and Sergei Dmitriev, representatives of Bee Pitron, talked about the methodology of enterprise PLM implementation as well as the company’s own software developments based on ENOVIA SmarTeam, illustrating their presentation with such examples as the Arsenal Machine-Building Plant, Kriogenmash and Tyazhmash, and the Kazan Engine-Building Production Association. 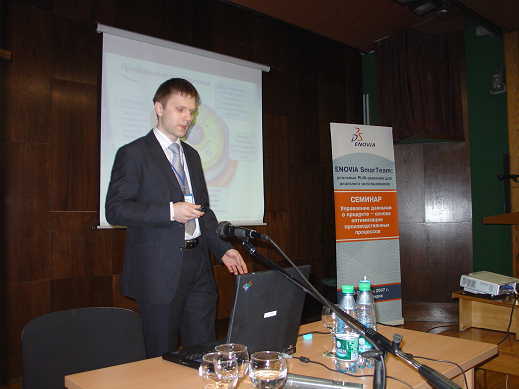 The audience became excited when they heard the story of implementing ENOVIA SmarTeam in Gasprom Media OJSC where the system is used to manage legal objects. 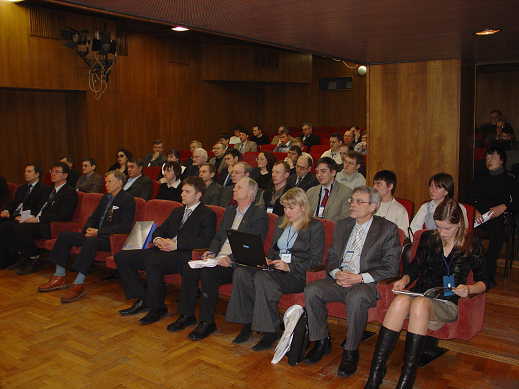 Even more important outcome of the venue were direct contacts established between the speakers and representatives of Novosibirsk companies such as the Chkalov Novosibirsk Aviation Production Association; Sukhoi Civilian Aircrafts; the Sever Production Association; the Sibsel’mash Science and Production Association; the Regional Electricity Networks; the Novolit company, and others. Numerous vigorous meetings and discussions took place behind the seminar stage clearly demonstrating the desire of Novosibirsk industries to implement entry-level PLM systems such as ENOVIA SmarTeam. 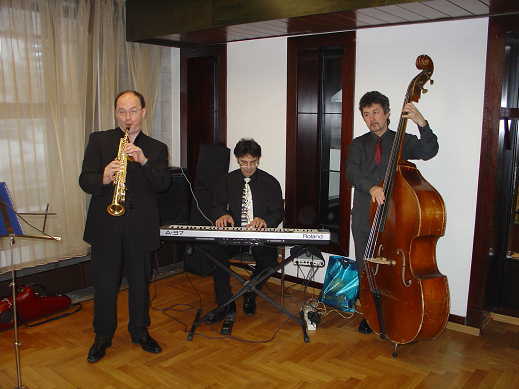 At the end of the first day of the seminar, the participants had a chance for informal discussions during the cocktail party accompanied by the performance of one of the leading Novosibirsk jazz band, headed by Andrei Turygin (saxophone). 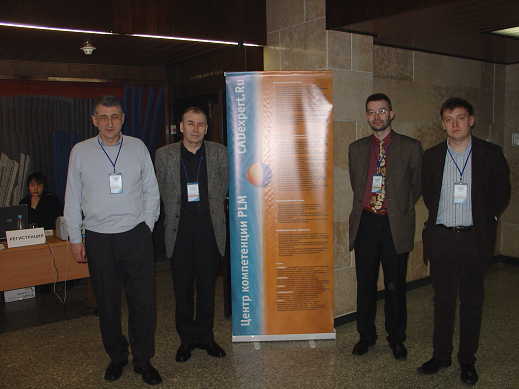 Participants praised the high level of event management, which was achieved due to the successful experiences of organizing similar conferences under the umbrella of the isicad informational community and LEDAS of Novosibirsk, with technical support provided by SibCongress and Sib3. 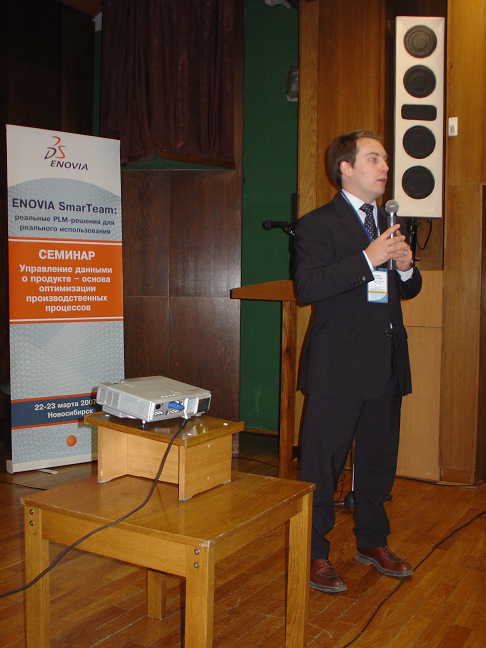 ENOVIA SmarTeam seminar became the first venue organized by the PLM Competence Center (www.cadexpert.ru), an alliance of Novosibirsk companies aimed to provide comprehensive services in the field of informatization of industries.